THE KELANI RIVER IS 145- KILOMETER LONG (90MILES) RIVER IN SRI LANKA. RANKING AS THE FOURTH LONGEST RIVER IN THE COUNTRY, IT STRETCHES FROM THE SRI PADA MOUNTAIN RANGE TOP COLOMBO. IT FLOWS THROUGH OR BORDERING THE DISTRICTS OF NUWARAELIYA, RATNAPURA, KEGALLE, GAMPAHA AND COLOMBO. THE KELANI RIVER WHICH ALSO FLOWS THROUGH THE CAPITAL OF SRI LANKA COLOMBO PROVIDES 807. OF ITS DRINKING WATER. IN ADDITION THE RIVER IS USED FOR TRANSPORTATION, FISHING, AND PRODUCTION OF HYDROELECTRICITY, SEWAGE DISPOSAL AND SAND MINING. THROUGH THESE FACTORS, MANY PEOPLE DEPEND ON THE RIVER FOR THEIR DAILY ROUTINE IN LIFE. TEN RIVERS IDENTIFIED AS THE ONES CAUSING THE MAXIMUM DAMAGE BY FLOODS WERE COVERED UNDER THIS PROJECT. THEY ARE MALWATHU OYA, KALA OYA, MAHAVELI, DEDURU OYA, MA OYA, ATTANAGALU OYA, GIN GANGA, GAL OYA AND KELANI RIVER. DESPITE THE CHANGE OF GOVERNMENT THE PROJECTS CONTINUED. WITH THE DEVASTATION THAT TOOK PLACE IN THE AFTERMATH OF THE FLOODS IN 2016, A PRESIDENTIAL ORDER WAS MADE TO THE PROJECT DIRECTOR TO PRIORITIZE THE PROGRAMME COVERING THE KELANI RIVER. ACCORDINGLY THE STUDY OF THIS PROGRAMME WAS ACCELERATED AND WORLD BANK TOO STEPPED IN TO PROVIDE ASSISTANCE. The author of “Hans a Sandeshaya” in his poetic compilation described the beauty of the Kelani River in the following manner; To the Swan who was taking a message or a Sandeshaya. Kelani River is connected closely with the Sinhala Buddliist Culture of Sri Lanka, especially with the people living on the area identified as Kelani Valley. This is primarily caused by the fact that Kelani River is associated with two of the most venerated Buddhist shrines and pilgrimages, which are the Sri Pada Mountain and the Kelani Raja Maha Viharaya. At present the two main concerns in connection with the river are flooding during the monsoon and saline intrusion in the dry season. The Kelani River water levels affect the flood risk to Colombo, capital of Sri Lanka. One reason is that part of the city and suburbs of Colombo lie on the lower flood plain of the river. Exposure of Colombo and upper catchments of Kelani River to the same monsoon i.e. South West Monsoon is another reason. Saline intrusion is enhanced by the deepening of the river due to sand mining, which causes the river bed to sink by approximately l0cm (4in) per year. Despite all these there are many people whose lives revolve around this great river, which also adds immense beauty to the natural splendor of the island. This river which flows through the capital city has now become a reason to mourn for the people of both Colombo and Gampaha districts. With the torrential rains during the monsoon, the river overflows, destroying houses, factories, government buildings, schools and cultivations of fanners located on the lower flood plain of the Kelani River. According to the figures provided by the Irrigation Department the annual reimbursement for total damages sustained is around 38 0 -4 0 0 Million. Kelani River has now become a thing which is pulling back the progress of the country. Are we not capable in turning this resource into a source of enrichment? The Ministries of Irrigation, Water Resources Management and the Disaster Management have taken up the challenge and are confident that they could prove it, as they now have a set plan of action. A River, whether it becomes a resource for a country or brings in ruin to a country depends on the Government policies, the thinking of the Politicians, their keenness and the action of the officials. Many officials are in possession of action plans, but they depend on the political authority’s approval, which is based on the political advantage for them. Some are worried whether they could complete the action plan during their rule and there had been instances where some have considered about the economic benefits to them. These drawbacks delayed most of the projects in the past. However in 20 1 4 during the last lap of the previous government a forthright decision was taken. That was to establish a project to reduce the adverse impact of climate change as a new project under the Ministry of Irrigation, Engineer Sudarma Elakanda was appointed as its Director. U S Dollars 152 Million has been allocated to reimburse for the loss suffered by the environment. Due to the overflowing of the Kelam River on its banks and also for research and study. This work has to be completed within five years. It was the task of the project animators to eradicate the loss caused by the floods and to conduct surveys for resettlement under the programme of action. The study had brought out several proposals. One was to divert a portion of the rapid waters during floods from Pugoda area through a different route and allowed to flow into the sea. The second was to restore and renovate the river banks and sluice gates constructed during the colonial era and control the flood waters. Both these proposals were rejected but the third was accepted and no one objected. The preliminary work of which has now commenced. The proposal is to construct flood breakers and barriers fifty feet away from the banks of the river from the mouth of the Kelani River at waters meet to Hanwella. There are several intervening proposals which include the renovation of sluice gates located in the river bunds and canals and also construct sluice gates in identified canals and when the water level in the river rises the excess water to be allowed to flow through these canals thereby averting any damage to the people living along the banks of these canals and to properties. In addition with the construction of the flood breakers and barriers the water that naturally flows into the river during the rainy season get collected and this water to be allowed to flow into an identified location and pumped back to the river by pumping stations which are to be constructed. These barriers would have a height of two to three meters. The height would depend on the water level of the river and the ground elevation o f a location. The area between the barrier and the bank of the river would be developed to include leisure areas, jogging tracks, shady trees with benches for people to sit and relax, areas for children’s parks and viewing areas for the general public and tourists. Engineer Elakanda said these areas would have a pleasing environment for children youth and adults. The animators of the project believes that once the project is completed it would attract the local and foreign tourists and win their accolades and Kelani River and the embankment area extending from Colombo to Hanwella area would be accepted by many as an ecological zone. The type of flood breakers and barriers world over differs in pattern and architecture. In some countries these barriers have been designed in such a manner that they could be moved away at times they are not needed. Some other countries these are turned out of glass and which are mounted on walls built with boulders. Some of them are removable and used only during floods. There are steel gates put up in other countries which are raised only in times of floods. Countries have also installed s e lf operating or automatic barriers in areas where the population is low. It is a requirement that any river should have a conservation area of about fifty feet. B u t in our country it is observed that the embankment area been filled up and encroaching the river many constructions had sprung, resulting in more losses to human lives and damages to property during floods. With these constructions obstructing the free flow of flood waters the damage caused during floods is more severe. 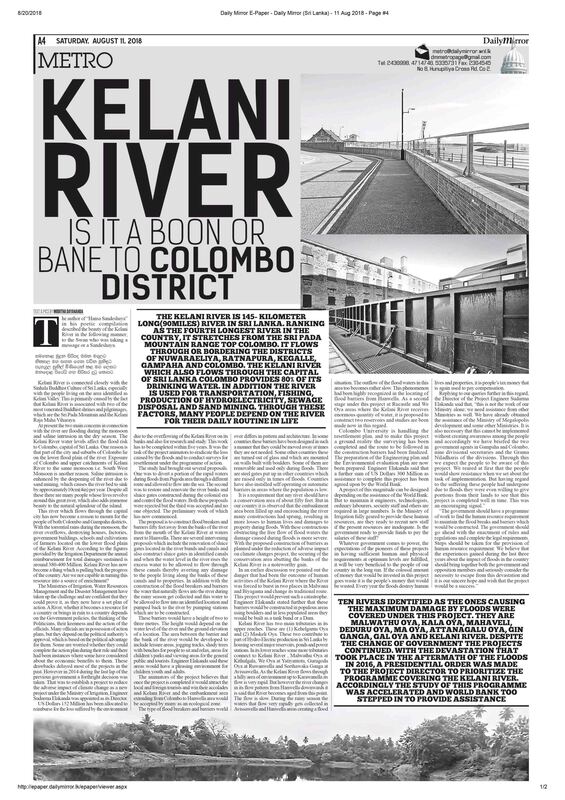 With the proposed construction of barriers as planned under the reduction of adverse impact on climate changes project, the securing of the conservation area abutting the banks of the Kelani River is a noteworthy gain. In an earlier discussion we pointed out the danger that had been the outcome of human activities of the Kelani River where the River was forced to burst in two places in Malwana and Biyagama and change its traditional route. This project would prevent such a catastrophe. Enginee r Elakanda stated further that these barriers would be constructed in populous areas using boulders and in less populated areas they would be built as a tank bund or a Dam. Kelani River has two main tributaries in its upper reaches. These are (1) Kehelgamu Oya and (2) Maskeli Oya. These two contribute to part of Hydro-Electric production in Sri Lanka by housing several major reservoirs, ponds and power stations. In its lower reaches some more tributaries connect to Kelani River , Mahvathu Oya at Kithulgala, We Oya at Yatiyantota, Gurugoda Oya at Ruwanwella and Seethawaka Ganga at Avissawella. As the Kelani River flows through a hilly area of environment up to Karawanella its flow is very rapid. But however the river changes in its flow pattern from Hanwella downwards it is said that River becomes aged from this point. The flow is slow. During the rainy season the waters that flow very rapidly gets collected in Avissawella and Hanwella areas creating a flood situation. The outflow of the flood waters in this area too becomes rather slow. This phenomenon had been highly recognized in the locating of flood barriers from Hanwella. As a second stage under this project at Rucastle and We Oya areas where the Kelani River receives enormous quantity of water, it is proposed to construct two reservoirs and studies are been made now in this regard. Colombo University is handling the resettlement plan, and to make this project a ground reality the surveying has been completed and the route to be followed in the construction barriers had been finalized. The preparation of the Engineering plan and the Environmental evaluation plan are now been prepared. Engineer Elakanda said that a further sum o f U S Dollars 3 0 0 Million as assistance to complete this project has been agreed upon by the World Bank. A project of this magnitude can be designed depending on the assistance of the World Bank. But to maintain it engineers, technologists, ordinary labourers, security staff and others are required in large numbers. Is the Ministry of Irrigation fully geared to provide these human resources, are they ready to recruit new staff if the present resources are inadequate. Is the government ready to provide funds to pay the salaries of these staff? Whatever government comes to power, the expectations of the pioneers of these projects in having sufficient human and physical requirements at optimum levels are fulfilled, and it will be very beneficial to the people of our country in the long run. If the colossal amount of money that would be invested in this project goes waste it is the people’s money that would be wasted. Every year the floods destroy human lives and properties, it is people’s tax money that is again used to pay compensation.